Salesforce Social Studio is a social media management and listening tool optimized for Salesforce Suite users. It allows businesses to publish posts, engage and listen to their community, as well as track the performance of their social media campaigns. We compiled reviews from our website and around the web and determined that Salesforce Social Studio has generally positive ratings. Users who gave Salesforce Social Studio a positive review liked that the product serves as a one-stop shop for publishing posts, engaging with social audience, and monitoring brand mentions. They also said that the dashboard is easy to use and navigate. Users also mentioned that the graphs generated from the app look nice and are ready for reports and presentations. Users who gave Salesforce Social Studio a negative review said that managing multiple accounts using the platform is not that simple and intuitive. They also complained about how difficult it is to contact the support team for issues and concerns. Salesforce Social Studio doesn’t publish its pricing plans online. However, services from providers similar to Salesforce Social Studio usually cost around $0 to $99 for apps with basic and straightforward functionalities, while more extensive ones cost around $99 to $599+/month. Interested users need to get in touch with their sales team to request for a quote. Check out the list below of some of Salesforce Social Studio’s features. Does Salesforce Social Studio offer a free trial? There was no mention of a free trial on Salesforce Social Studio’s website, but interested users can request for a demo of the software. 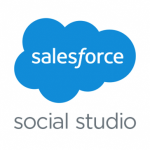 What are the social networks supported by Salesforce Social Studio? 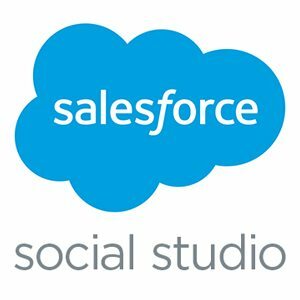 Salesforce Social Studio supports Facebook, Twitter, LinkedIn, Google+, YouTube, Instagram, Instagram Business, Pinterest, and Sina Weibo. This video provides an overview on how to use Salesforce Social Studio. It also provides information on how to reach out to your social community in an engaging way. Not sure if Salesforce Social Studio is the right fit for you? Read our reviews of all top social media management software or check out one of these three Salesforce Social Studio alternatives. Social studio positions itself as a one-stop-shop for any marketer’s interaction with its audience in three key areas – first, it allows you to schedule post to be published on your social channels (Publish); second, it enables you to engage with your audience when they respond to your content (Engage); thirdly it helps you monitor the media universe for mentions of your brand, or indeed of anything really, and establish where media presence is being built (Analyse). In this regard, offering these three facets in one solution is a fantastic idea. Marketers can really get a handle on building profile and engaging with their audience. Let’s face it, Salesforce is a ubiquitous tool which it’s likely your organisation will have, so adding Social Studio to your subscription is a neat way to get you up and running quickly. For me the inherent weakness in the platform is that it is not a full-function, feature-rich solution in any of the three areas I mentioned above. Yes it is totally usable in this regard, and it is great you have these key suites under one roof, and it does a pretty solid performance in these areas, but if you are looking for a fully-fledged solution to deep-dive into these areas then Social Studio may leave you wanting more. On the analysis side in particular I find it lacking in delivering reach and engagement scores for competitor brands. The UI is pretty slick but takes a while to get used to – many of the granular settings are accomplished via multiple sub-menus that are not easily found. The true breadth and depth of technological capability of the three suites. To be fair, and as I already said, I’m sure it’ll be a great tool for many marketers, but for those who want a little bit more, do your homework before committing. You may find it a preferable option to go for an off-the-shelf tool that does the job of one of Social Studio’s elements in a more user-friendly and granular way. Quick overview of key metrics, and nice looking graphs – ready for reports and presentations. The intelligence you get and the social listening tools can be reallly helpful to monitor the accounts. We found that managing multiple accounts is not that simple or user-friendly. I use Social Studio for scheduling Facebook, Twitter (two separate accounts), LinkedIn and Instagram posts for my organization. I like how easy the platform makes scheduling and monitoring posts. There have been times where I’ll schedule a dozen tweets for one day and it’s easy to drag, drop and reschedule them for another time that day, which is much easier than having to go back into each tweet and selecting a different post time. Perhaps this is a complaint for Instagram and their posting policy, not Social Studio. All I know is that it’s a real pain if you’re trying to schedule an Instagram post through Social Studio. You can’t really schedule an Instagram post via Social Studio; it’s more like just saving your content and alerting you at the proper time. Then, you’re required to go into Social Studio, basically verify that the Instagram account you’re trying to post to belongs to you (which, by the way, make sure your IG app is currently on the correct profile if you have multiples or you’ll have to close out and try again), hit “confirm”, then it brings you to a screen with all the content (photo and caption) that you previously saved to verify, except there’s no easy way to just verify and post it. I always get stuck on this step and end up having to copy/paste the text into a new IG post and delete the one I scheduled via Social Studio. I wish we would’ve known the limitation the platform had with scheduling to Instagram. Our contract allows the use of up to three platforms — two for Twitter and one for Facebook. If Instagram was more user-friendly on Social Studio, I’d prefer our three platforms to be Facebook, Instagram and one Twitter. Salesforce Social Studio has the scheduling of social posts done pat! They’ve made it very easy and convenient to schedule social posts to all major social channels, from one easy-to-use and navigate platform. Love the convenience of drag and drop to reorder and reorganize posts that are scheduled to go out. Obviously with this being a Salesforce product, it’s great to have a native integration between scheduling social posts and our Salesforce CRM. There is room to improve on the side of monitoring profiles… It’s a bit messy trying to dig into different profiles, based on the UI/UX of the software. Nothing. You know when you are using Salesforce products, you are working with high quality development. Great company, great products.